Father's occupation: Physician and surgeon, M.D., M.R.C.S., L.S.A. Matriculated at the University of Oxford from Jesus College in 1899 with Open Mathematical Exhibition. Matriculated at the University of Oxford from Jesus College in 1899 with Open Scholarship in Natural Science. and also on the war memorial of the Wesley Memorial Church in New Inn Hall Street, Oxford. 1911: Walter (18) was in his final year at school and living at the Wesley Deaconess Institute, St Margaret's Lodge, Queen's Road, Ilkley, Yorkshire with his parents and younger sister. His father was now Warden of this Institute and five Deaconesses and 21 Probationer Deaconess students were living with them, plus five servants. 1911: Leonard (18) was boarding at Llandovery College. Matriculated at the University of Oxford from Jesus College in 1908. Educated at Wimbledon College, and then entered the Philosophy course at Stonyhurst in October 1911. He left Stonyhurst before completing the school year, and then attended the Boys' High School in Oxford. Occupation after graduating: Gazetted to the Indian Army from Sandhurst. Enlisted September 1914 and served in France as a stretcher-bearer. He was wounded and returned home in 1916 and was commissioned after undertaking a cadets' course. Captain and Adjutant, Royal Garrison Artillery, Adjutant 66th “Y” Brigade H.Q. Born in England in Darlaston, Staffordshire in 1894 (reg. second quarter). Also remembered on the war memorial of the Wesley Memorial Church in New Inn Hall Street, Oxford. Matriculated at the University of Oxford from Jesus College in 1903 (not 1908 as given in OURS). Matriculated at the University of Oxford from Jesus College in 1910. Open Exhibition in Natural Science. St Paul's Church war memorial, Oxford (which has been moved to St Barnabas's Church). He is also almost certainly the S. Griffin listed on the Walton Street Methodist Chapel war memorial (now moved to the Wesley Memorial Church), which has a FULL BIOGRAPHY. Matriculated at the University of Oxford from Jesus College in 1906. Welsh Classical Exhibition. Matriculated at the University of Oxford from Jesus College in 1907. Welsh Classical Scholarship. Classics Mods I(third class) in 1909, B.A. Literae Humaniores (Third Class) in 1911. Matriculated at the University of Oxford from Jesus College in 1906. Open Mathematical Exhibition. 1901: Reginald (4) was living with his parents and four siblings at 2, 3, & 4 New College Lane, Oxford, where his father was a servant of New College in charge of college property. His older brothers were working: Ernest (16) was a gas company clerk, and Harry (14) was a cook's apprentice. Matriculated at the University of Oxford from Jesus College in 1911. Open Mathematical Scholarship. 1901: Griffith (10) was living at Gyffin Rectory, Gyffin, Caernarvonshire with his father Robert (52), his mother Ellen (44) and his nine siblings Mary (19), Richard (18), Ellen (17), Isabella (15), Hugh (12), Gwladys (9), Howel (8), John (4), and Arthur (2). His grandfather Robert Jones, a widower of 75 who was a retired baker, was also living with them, and they had a 16-year-old servant girl. This man who	was born in Edeyrn, Tudweiliog, Caernarvonshire on 27 June 1884 was matriculated at the University of Oxford from Jesus College in 1903 but never attended a graduation. In the First World War he served as a Second Lieutenant with the Royal Welch Fusiliers, and it was reported at a college meeting that he had been killed in action on 8 July 1917 at the age of 33. His death was also recorded in the college's admissions register, but a further note was added there that he had not been killed. He in fact died on 5 January 1951 at 32 St Margaret's Road, Oxford. None the less he is listed as having been killed in the First World War on the Jesus College war memorial board and in the Oxford University Roll of Service. 1891: Frederick (eight months) was living at 43 Alderson Road, Wavertree, Liverpool with his parents. Matriculated at the University of Oxford from Jesus College in 1904. Meyrick Exhibition in Modern History. He married Margaret L. M. Dawes at Sutton Coldfield near Birmingham on 30 November 1916 and had one son, Stanley Francis Salmon, born posthumously in the Tamworth district (probably at Maney, Sutton Coldfield) on 23 August 1917 (died 2002). St Peter's Church, Maney, Sutton Coldfield. 1901: Stanley (15) was boarding at Llandovery College, Carmarthenshire. 1901: Kenneth (4) was living at 45 Hawarden Avenue, Liverpool with his parents and two older sisters, plus their servant. 1901: Robert (18), described as a student at University College (London) was living at 16a Chesilton Road, Fulham with his parents and two siblings. Matriculated at the University of Oxford from Jesus College in 1912. Open Modern History Exhibition. Matriculated at the University of Oxford from Jesus College in 1905. Welsh Classical Scholarship. Matriculated at the University of Oxford (apparently as non-collegiate student) in 1910: Pass Mods in 1911. 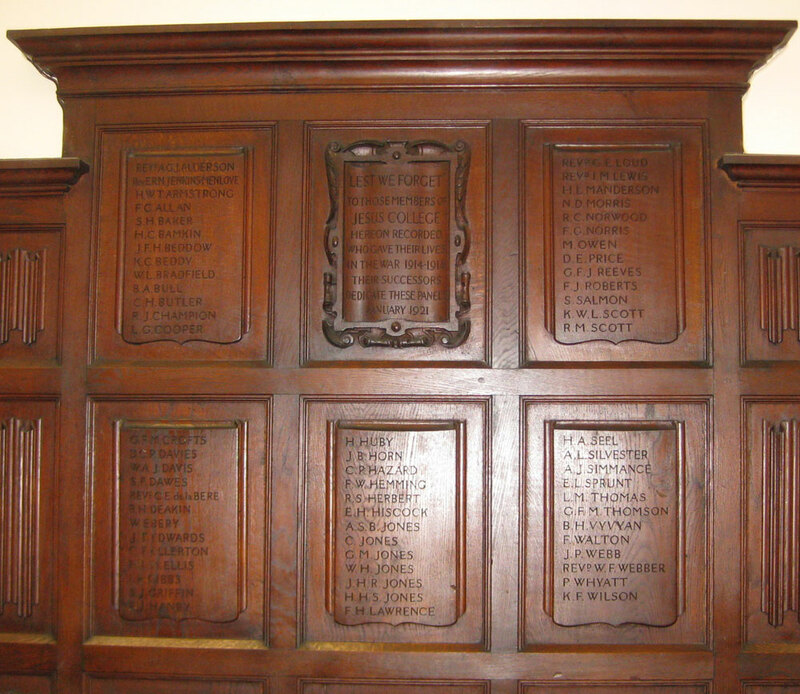 A man called M. ANDREW is recorded under Jesus College in the Oxford University Roll of Service as having been killed in action on 4 November 1918, but is not listed on the college's memorial board. It appears that OURS has confused Melville Andrew, who attended Jesus College and appears to have survived the war, with Malcolm Andrew, who did not attend Jesus College, but was killed on the day given for the death of M. Andrew. The inquest on John Ainscow Dugdale, undergraduate of Jesus College who shot himself near Binsey Church, was fully reported in the Oxford Times of 31 October 1919 (p. 7). Dugdale had fought in Mesopotamia, and it was said that his health had been undermined by war service. A verdict of “Suicide in a fit of temporary insanity” was given.